Attendant. 2015. Oil on canvas. 30 x 24"
Dana DeGiulio @ The Suburban. 2013-2014. Buick at building. Oak Park, IL. Description on image. Tape. 2013. 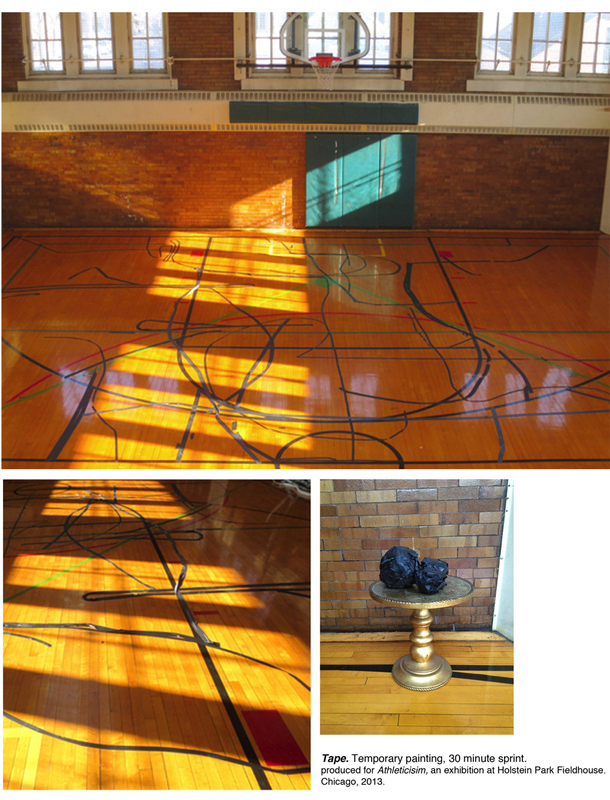 Gaffer tape on basketball court. Chicago. Description on image. Architeck. 2014. 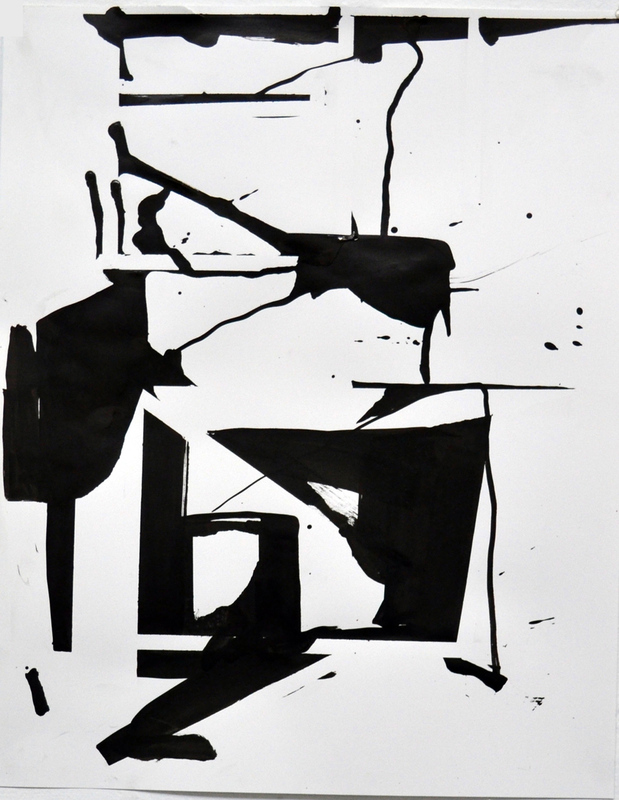 Ink on paper. 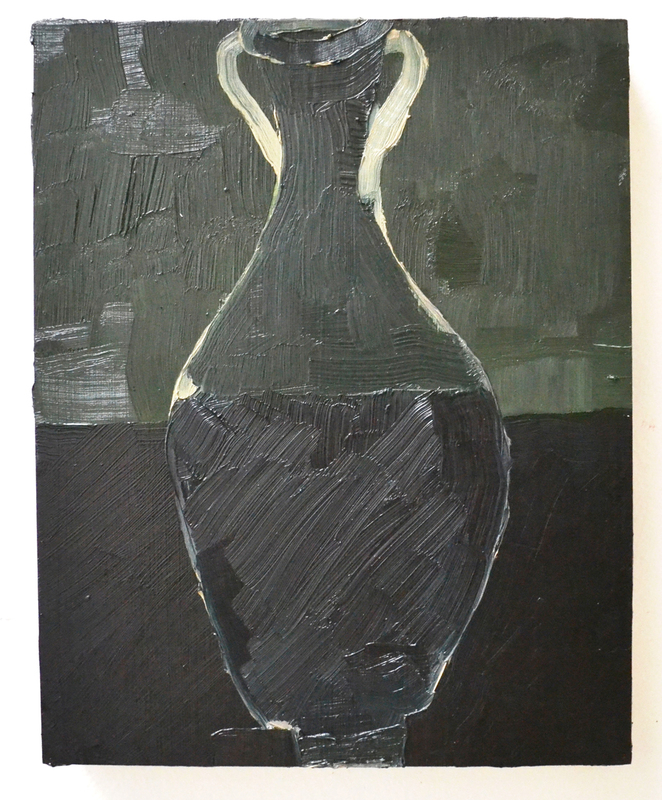 30 x 24"
Black Jar. 2013. Oil on panel. 12 x 9"
Antigone. 2014. 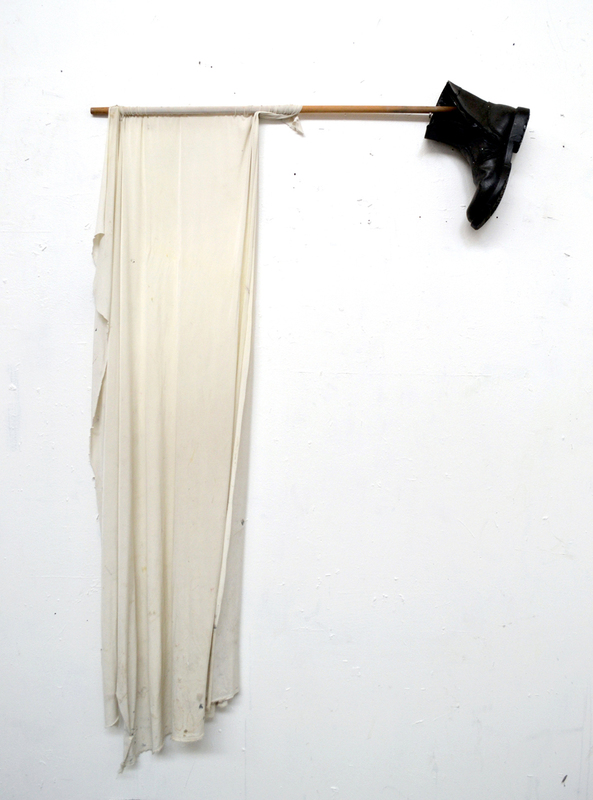 Rubberized boot, repurposed surrender flag. 70 x 48"
Nowhere Without The No. 2013. Ink on paper. 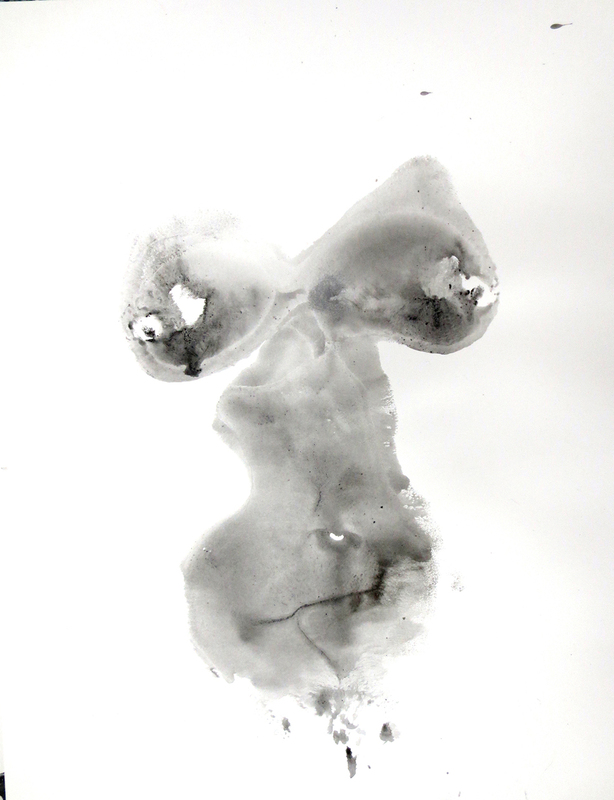 Torso print, mine. 40 x 32"
Noseless head. 2013. 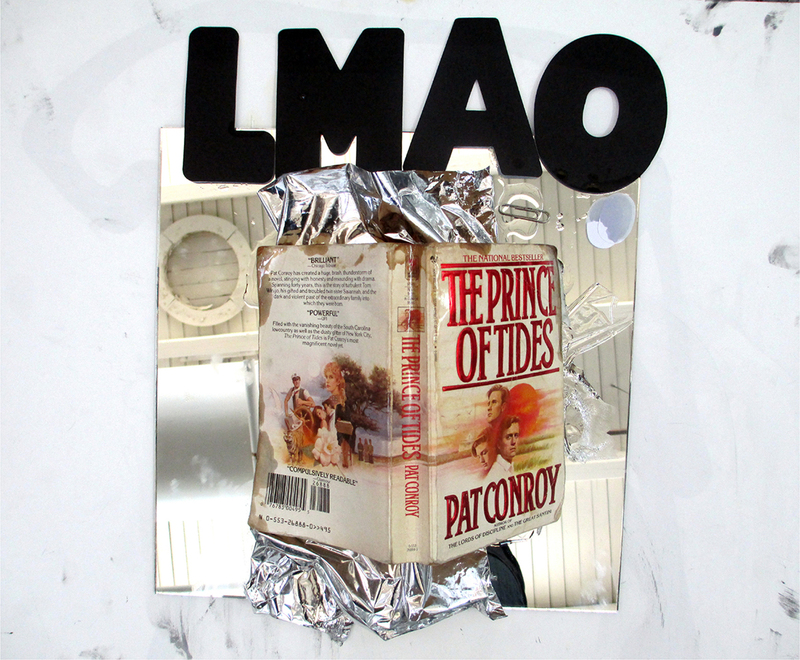 Mirror, paperback, precut letters, glue. 16" square. I Think That I'm Bigger Than The Sound. 2011. 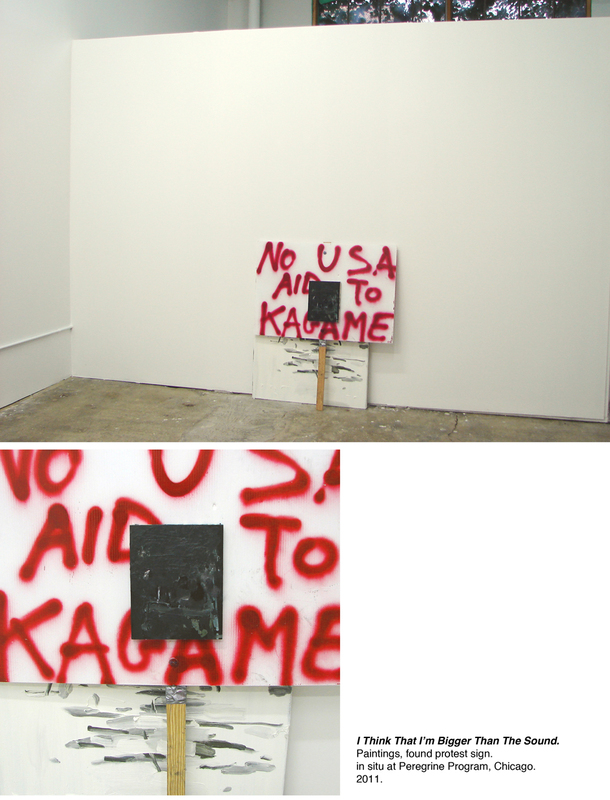 Found protest sign, two paintings. Dimensions variable. 48" tall. Free Figure Drawing. 2014. Direct action, Fire Island. Description on slide. Ruin is formal. 2010-2013. Description on slide. 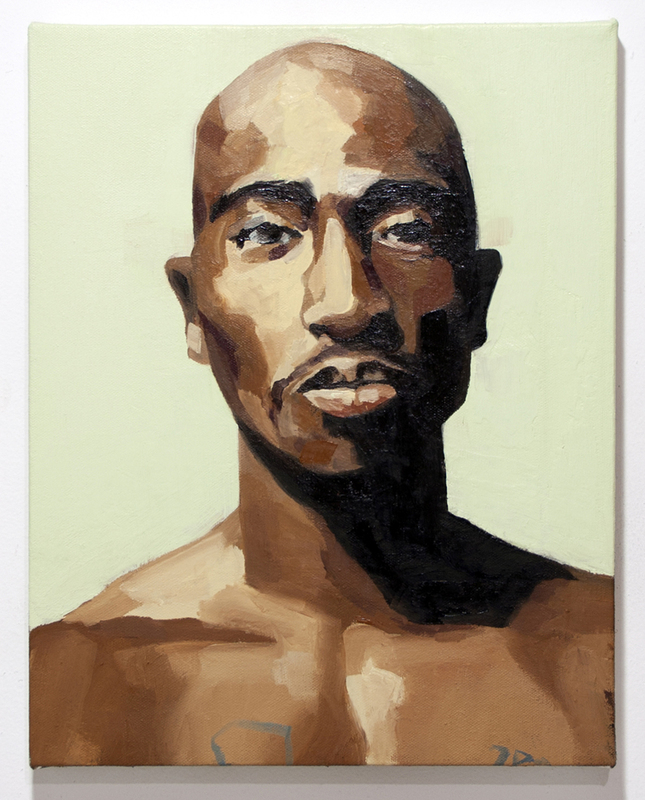 Queer Painting (2Pac). 2014. Oil on canvas. 20 x 16"
Ardor Vacui. 2011. Description on slide. Talking. 2012. 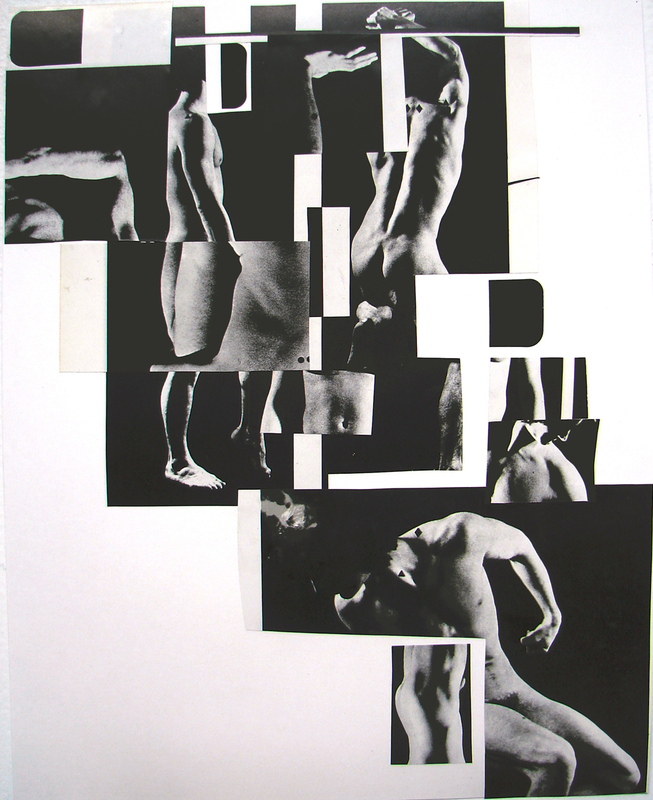 Collage on paper. 17 x 14"
Holy Ghost and flower. 2014. Oil and enamel on canvas and panel. Diptych. 32 x 32”, this iteration. untitled reacher. 2010. Description on slide. Face of the object says Guess-what, which is not a question but a request for action. Absence, or the hyphen as in uh-oh, a glottal stop, run through. The text of the body of the bodies of these objects is the whole thing. Each action, caught and held by rectilinear surface, by architecture, by videotape, the ecstatic captive of its inquiry. The dead are exhilarants. History fucks me up and licks my face; asks what ardent demand, what fractious gift, how to give an account of oneself. The dialectics are of reverence and impatience. Indoor or outdoor is an important distinction, and if there is weather. Insistence fundamentally on an ordinary anthropometric, to scale, which posits the actor as human (solitary, alert, temporary, contingent, bipedal), working within and against institutional architectures. Where there is permission, I take it to heart. I work hard, without funding. I want to do something for and about the world. The work is sometimes crude, but it is all done precisely out of baffled love. Sometimes you get a laugh. The arms aren’t empty, they’re open. I have lived in New York for exactly one year. I came wanting nothing but to see it, and it is awful and beautiful and I have found people to be extraordinarily gentle with each other. It is important that the work circulate. I circulate. I trained as a painter and teach painting and that is my lens, and sometimes produce other things so as to circulate. I make anything I feel to be necessary, and try to remain sensitive, understanding that maybe grief and history and agitation in one’s brain and body all hold the same sarcastic rhetorical power, all repeat: you want to go home but this is home. Nothing, however, ever, says too late. MFA, 2007: The School of the Art Institute of Chicago. Coney Island Sound. Performative audio tour. F Train to ocean. NYC. Flash! Dana DeGiulio. California Museum of Photography. Riverside, CA. I Work All Day and Night . With Eliot Porter. Night Club. Chicago. Dana DeGiulio @ The Suburban . Oak Park, IL. Ruin is formal. Public sculpture. Outside the Pergamon Museum. Berlin. Say Say Say . Iceberg Projects. Chicago. The Port is Pitiful . With Daviel Shy. Doč asný 404. Prague, Czech Republic. Show. Curated by Audrey Adams. Julius Caesar. Chicago. Kabinett 3: Dana DeGiulio + Hermann/Ruhwald . Devening Projects. Chicago. To Fill a Gap— Insert the Thing that caused it . With Molly Zuckerman-Hartung. Riverside Arts Center. Riverside, IL. Erect . Julius Caesar. Chicago. Red Peter . With Molly Zuckerman-Hartung. Dominican University. River Forest, IL. That House Is On Fire . Carrie Secrist Gallery, Chicago. Thud . Julius Caesar, Chicago. Enter, fleeing . Contemporary Art Workshop. Chicago. There Has Always Been Something Exasperating About My Gifts . With Yevgeniya Baras. Roots + Culture Contemporary Art Space. Chicago. Versus . With Audrey Adams. Old Parole Board. Madison, WI. Sardanapolus . The Down-Under Pub. Grinnell, IA. Listening and Making Sounds . Curated by Molly Zuckerman-Hartung. Poor Farm. Manana, WI. Always Already Here . Curated by Joshua Bienko. Ortega y Gasset Projects. Baltimore. Posse . Curated by Sophia Rauch. Private Residence Exhibition Space. Snowmass, Colorado. Girl Bye . Curated by Rashaad Newsome. Rush Arts. NYC. Cherry Grove Community Art Show . Organized by Dennis McConkey. Fire Island, NY. Noncompliance. Curated by Carrie Schneider. Iceberg Projects. Chicago. ReAnimate . Curated by William Lieberman. Zolla/Lieberman Gallery. Chicago. Not Or, But And . Curated by Melody Saraniti. 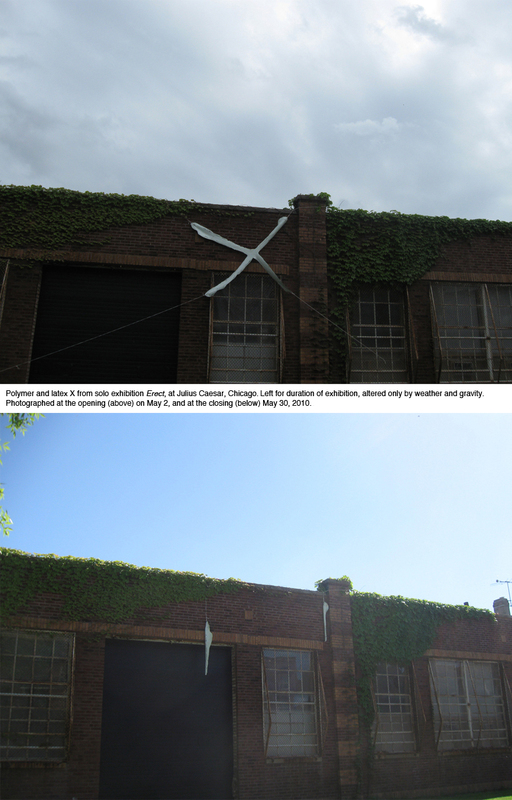 Hyde Park Art Center, Chicago. Miss Kilman and She Were Terrible Together . Curated by Matt Morris. The Hills Esthetic Center, Chicago. Making Space. Curated by Susanne Doremus. Zolla/Lieberman Gallery. Chicago. Sensitive Instruments . Curated by Molly Zuckerman-Hartung. Corbett v Dempsey. Chicago. Athleticism . Curated by Kaycee Conaway. Holstein Park Fieldhouse. Chicago. A long line . Curated by Edmund Chia. Peregrine Program. Chicago. Whisper Down The Lane . Curated by Lorelei Stewart. Gallery 400. University of Illinois at Chicago. Open Space: Proposal for a Future Museum . Curated by grupa o.k. Online platform. SFMOMA, San Francisco. A coffin, a door, a bowl of soup . Organized by Karsten Lund. New Capital Projects. Chicago. The Mindʼs I . Organized by Anne Harris. Julius Caesar. Chicago. Televisionism . Curated by Monika Szewczyk. Logan Center, The University of Chicago. Sic Transit Gloria Mundi : Industry of the Ordinary. Chicago Cultural Center. Chicago. Michelle Grabner: The INOVA Survey . INOVA. Milwaukee. Big Youth II: News from Chicago . Curated by Corbett v Dempsey. Bourouina Gallery. Berlin. Push/Pull . Curated by Karen Azarnia. Riverside Arts Center. Riverside, IL. Painted . Curated by Tyson Reeder. Green Gallery. Milwaukee. NADA Miami Beach : with Golden Gallery. Miami. Force would be absent from the relations of men. Curated by Edward Salem. Action Field Kodra: Thessaloniki Biennial. Greece. Nasty, Brutish and Short : Work by Julius Caesar . Peregrine Program, Chicago. MDW Fair , with Devening Projects + Editions. Chicago. Irritable Abstraction . Curated by Susanne Doremus. Julius Caesar, Chicago. A Coupling . Curated by Josh Reames. Hungryman Gallery, Chicago. Chicago 7 . Curated by Josh Reames. Darke Gallery, Houston TX. Gravity Matters and Shadowy Folds . Curated by Dan Devening. dok25a. Dusseldorf. Tomboy . Curated by Betsy Odom. Glass Curtain Gallery. Columbia College, Chicago. X-TREME STUDIO: Lily Briscoe . 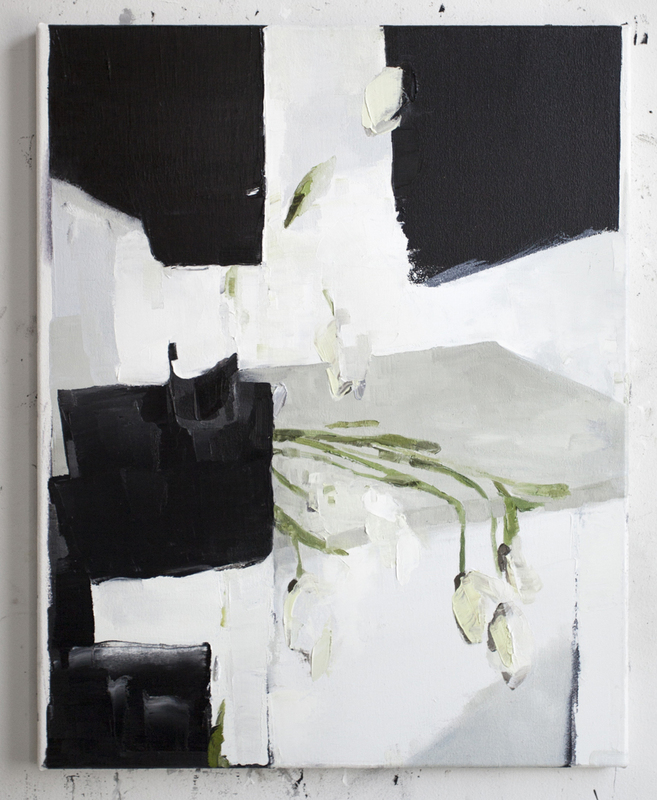 Curated by Sabina Ott. Columbia College, Chicago. Who Loves The Sun . Susanne Hilberry Gallery. Detroit. Picturing the Studio . Curated by Michelle Grabner. Sullivan Galleries. Chicago. Thrashold . Six-woman painting show. Highland Park Art Center. Highland Park, IL. FestFest . Performance and group show. Julius Caesar. Chicago. A Wreath of Poppies . Curated by Marc R. LeBlanc. Co-Lab. Copenhagen, Denmark. Artists Run Chicago . With Julius Caesar. Hyde Park Art Center. Chicago. Still Wet . Six-woman collaborative painting project. Julius Caesar. Chicago. ArtChicago . With Carrie Secrist Gallery. Chicago. Group Show (as Marina Vulti). Julius Caesar. Chicago. Preview ʼ08 . Group exhibition. Carrie Secrist Gallery. Chicago. NEXT Fair , an exhibition of emerging artists. ArtChicago, with Carrie Secrist Gallery. 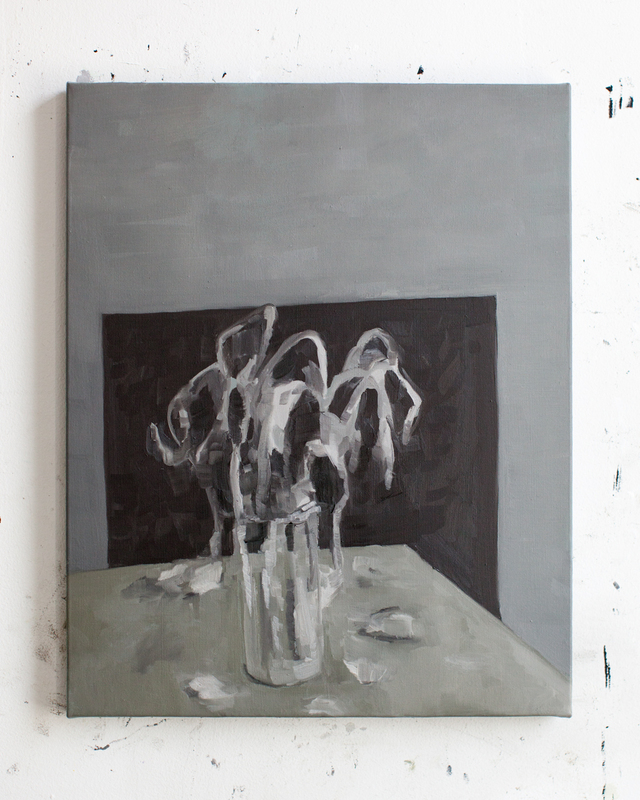 Struck: New Paintings by New Painters . Curated by Richard Hull. Carrie Secrist Gallery. Chicago. Interstate . Curated by Anne Staples. Contemporary Art Workshop. Graduate Thesis Exhibition . Gallery 2, SAIC. Chicago. Vomitorium (with Agitprop) . Curated by Philip von Zweck. Gallery 40000, Chicago. Bucket Of. Curated by Jason Hardwig. Popeyeʼ s Chicken Food Court. Chicago. Balls Out! Curated by Ezara Hoffman + Katie Jost. Erie Street Gallery. Milwaukee, WI. Fire Island Artist Residency (FIAR), 2014. Leslie + Lohman Gay and Lesbian Museum Fellowship, 2014. Visiting Artist appointment, ACRE Residency. Steuben, Wisconsin. July 2014. Pleasant Rowland Foundation Fellowship, 2005. Trustee Merit Scholarship. Full tuition compensation for graduate school at SAIC, 2005. Fire Island Artist Residency Lecture. Fire Island, NY. August 2014. Visiting Artist Lecture: ACRE Residency. Steuben, Wisconsin. July 2014. Visiting Artist Lecture: Tarble Arts Center @ Eastern Illinois University. April 2014. College Art Association (CAA ). Panel: Sensitive Instruments. February 2014. Dana DeGiulio + Judith Geichman . Carrie Secrist Gallery. Chicago. March 2013. Public Hearing: Dana DeGiulio + Carrie Schneider . Gallery 400. University of Illinois, Chicago. Nov 2012. 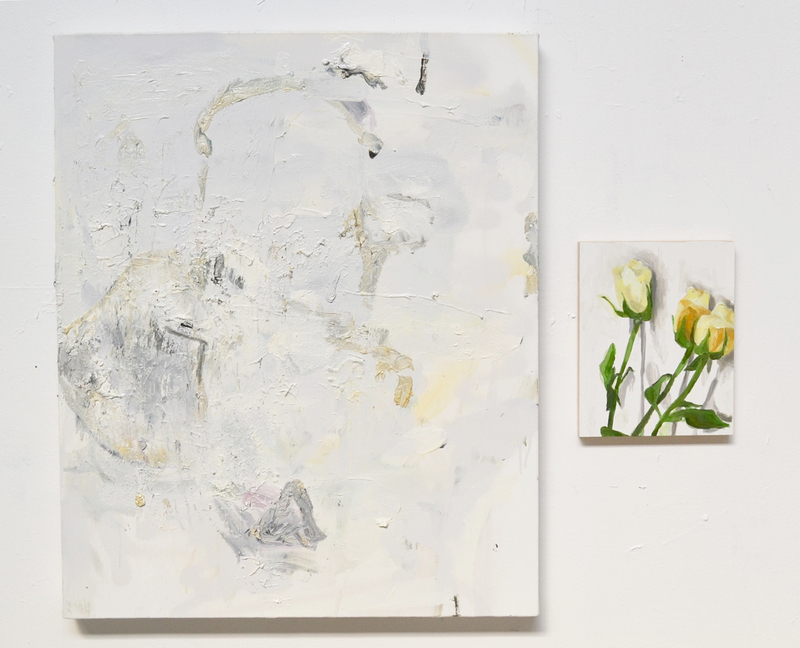 Dana DeGiulio + Molly Zuckerman-Hartung . Oʼ Connor Gallery. Dominican University. Oct 2009. You have to be there better than that if you want them to let you go . Pamphlet. 2013. Say Say Say . exhibition catalog. Published by Iceberg Projects. 2012. Stupid Pupil: I Will Be Good. with SAIC Sophomore Seminar. 2012. Heavenly Father I’m A Soldier . with Audrey Adams. words+images. Self-published. 2012. 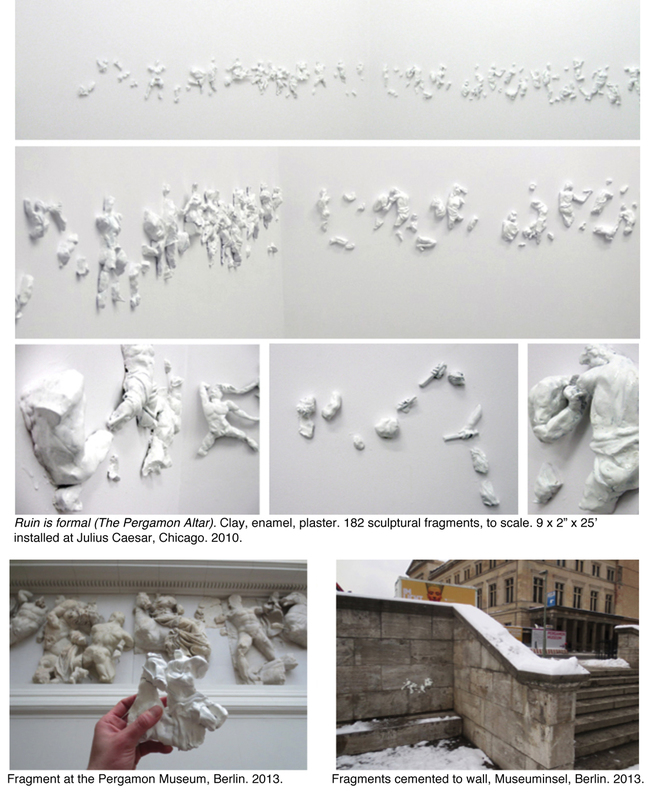 Possible Press: curated by Michelle Grabner. Vol 2, Issue 3. Fall 2011.
frequently the woods are pink . Catalog essay on Sabina Ott. Published by Wot It Is. 2010. Link : catalog, photo-essay, interview: on Judith Geichman. Published by Julius Caesar. 2009. Exhaust, the expiator : photographs, drawings, words, assorted ephemera. Self-published. 2005. Artforum.com: Scene + Herd: Threeʼ s Company. Article by Alex Fialho. Chicago Artist Writers. Review by Nick Bastis. Artforum.com: Criticʼ s Picks. Review by Matt Morris. Bad at Sports. “The Year of the Scavenger.” Review by Lise Bagesson Ross. NewCity. “Eye Exam: Goodbye, Good Taste.” Essay by Jason Foumberg. Mousse Magazine, Issue #33. “On Art, Language, and Consecutive Matters,” by Julian Myers. 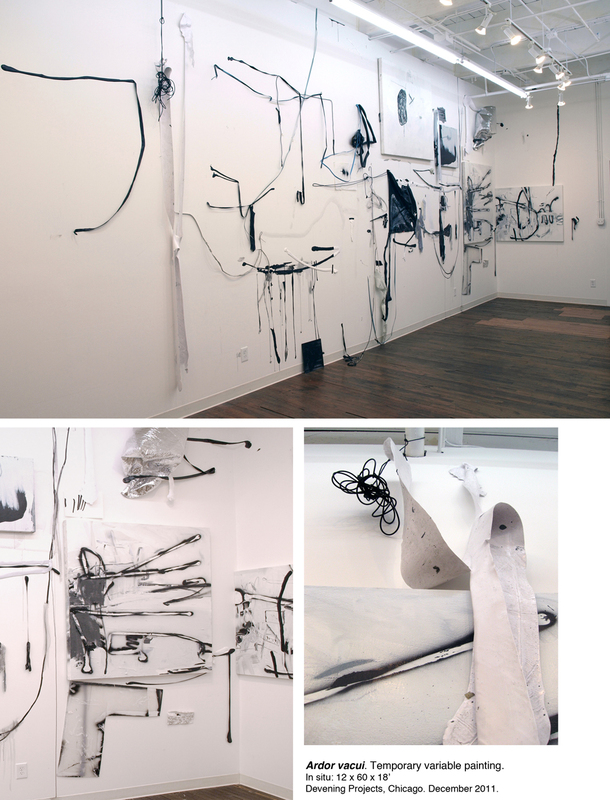 Artslant: Hyperlink interview with Courtney R Thompson. NewCity: Visiting Artist column. Molly Zuckerman-Hartung. 2010 NewCity. “Eye Exam: A Thing and Its Other.” Article by Jason Foumberg. Bad At Sports: Q+A with Claudine Ise. Artforum.com: Criticʼ s Pick. Review by Claudine Ise. Artforum.com: Criticʼ s Pick. Review by Michelle Grabner. NewCity. Exhibition review of That House Is On Fire . by David Wise. Core Faculty, Low-Residency MFA Program. The School of the Art Institute of Chicago. Adjunct Assistant Professor of Painting + Drawing. SAIC. 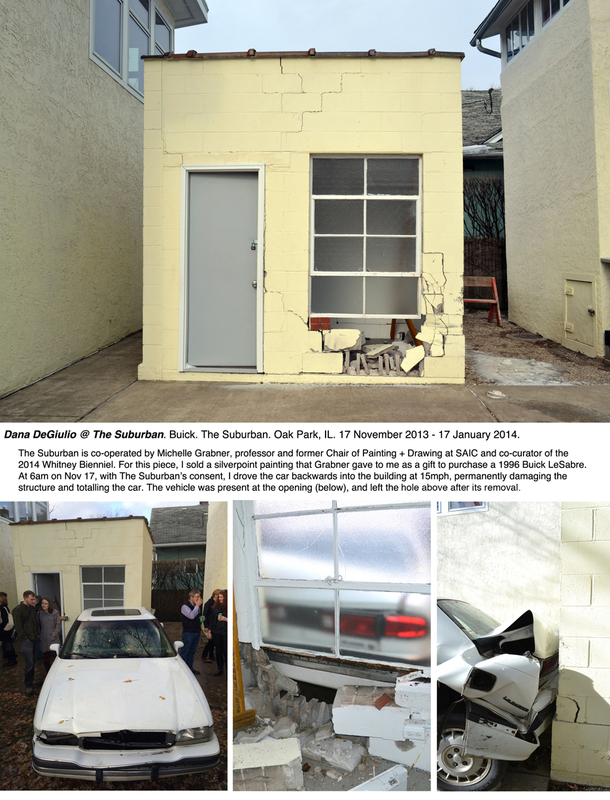 Co-founding director of Julius Caesar, an artist-run exhibition space in Chicago. 2008-2014.